Synchronous drive belt that resolves the problems raised by chain and gear drives. 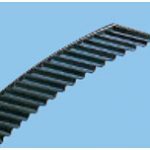 Shorter tooth pitch belts are suitable for precision devices and information apparatuses. Lightweight, thin and flexible belt permits space saving drive design. Offers high efficiency, high speed drives. Lower noise as compared to chain and gear drives.